The Vancouver Archdiocesan Central Council of the Society of St. Vincent de Paul, having been appointed Administrators of the Betty O'Flynn Memorial Fund, is pleased to sponsor a $500 bursary for full-time post-secondary studies directed towards a career – which in the opinion of the Memorial Fund Committee members- supports life issues. Applicants should be Vincentians, family members of Vincentians, or past/present beneficiaries of the Society; must be residents of/studying in B.C., and must submit with their application a letter of support from a member of the Society to whom they are not related. Applications should be submitted to the Society’s address marked for the attention of the Bursary Fund Committee and must be received by July 15, 2019. The successful candidate will be notified by August 15, 2019 and the bursary will be paid upon confirmation of enrolment in courses commencing in the fall of the award year. Renewal applications will be considered based on proof of educational attainment. The bursary will be presented by a member of the Society at a brief ceremony held in the candidate’s local area. At the conclusion of the Extraordinary Jubilee of Mercy, on November 20, 2016, in his apostolic letter, entitled Mercy and peace (Misericordia et misera), Pope Francis invited us to celebrate the World Day of the Poor on the 33rd Sunday in Ordinary Time. This year, we celebrate that special day on November 18th . According to the Canadian government, one million, nine hundred thousand Canadian families struggle every day to make ends meet. Just a few weeks before Christmas, we must do more than usual to help the least fortunate among us. For more than 170 years, the Society of Saint Vincent de Paul has been distributing Christmas hampers or organizing community meals. Such gestures of solidarity help less fortunate people to emerge from isolation, and allow them to experience wonderful moments of joy. By taking the time to welcome our sisters and brothers in Jesus Christ, not only do we give food, but we interact with them on an equal basis. In the Society of Saint Vincent de Paul, our tradition is to avoid judging and to serve people with love, respect, justice and joy. 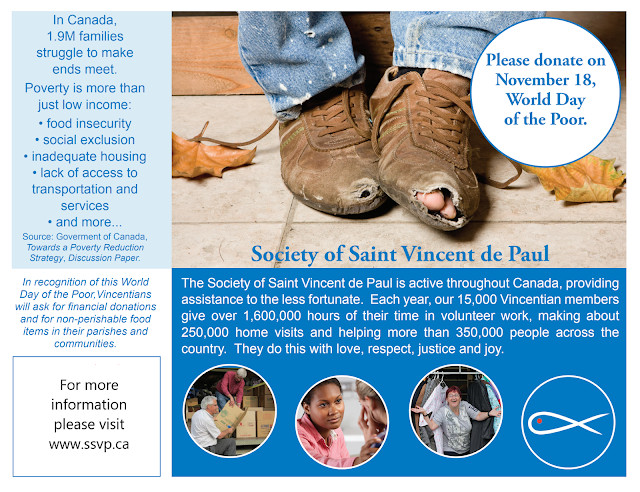 In response to Pope Francis’ appeal, we invite you to work with the members of the local Society of Saint Vincent de Paul and give a hand by participating in our collection of food supplies. In this very busy period, we also need volunteers and, of course, financial help is always appreciated as well. 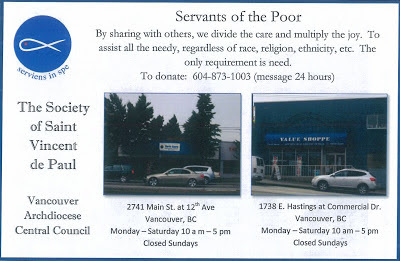 You may donate to the Society of Saint Vincent de Paul team in your community, or directly to the Society of Saint Vincent de Paul, via the official website, at the SSVP Vancouver Donation Page. We have updated our donation process in an effort to make supporting us a little easier on your part. You can still donate the old fashion way by sending your cheque to our business address. However, we have opened a PayPal account where you can make an online secure payment to our bank account through your Credit Card or Visa Debit Cards. You can also use Paypal to set up a reoccurring donation, if you so please. If you have any questions please email us at ssvpvancouver@gmail.com. To leave a comment or to donate to a specific program or conference of The St. Vincent de Paul, please click "comments or specifications" on the donation page and let us know. Drop in and Shop @ our Value Shoppes!! The Society of St Vincent de Paul operates two Thrift Stores in Downtown Vancouver. The perfect place to hunt for special treasures & support a local charity! Main St @ 12th Ave. Hasting St @ Commercial Dr.
* Please note: Stores will accept donations from 10am to 4pm Monday to Saturday. Have you been to our stores recently? The St Vincent de Paul Society, Christ the Redeemer Parish (West Vancouver, BC) have prepared a publication entitled "Reflections - Everyday Vincentian Spirituality" to mark the Year of Faith and as a means of promoting the Vincentian charism begun by Ozanam. Please feel free to share this with your own Conferences & members. Thank you to Mike Donelson & the SSVP, Christ the Redeemer Conference for sharing.